Time to share thoughts about Louise Penny’s newest novel, Kingdom of the Blind. A stranger has named Chief Inspector Armand Gamache to be one of the executors of her will, Still suspended because of an investigation in a case that went wrong months before, Gamache agrees to accept the task as a way to keep occupied. What would seem to be a straightforward duty becomes troublesome, however, when he sees the bizarre terms of the will. As if that weren’t enough, the case that got him suspended rears its ugly head again and he must track down missing drugs and work to clear his name while at the same time figuring out who murdered one of the heirs. I really wish I had read the acknowledgments before starting the book — they are at the end– because they inform the reading so much. It turns out Louise Penny based her main character Armand Gamache on her husband Michael. In a few sad, wry, warm, stunning paragraphs she reveals how she thought the series was over when her husband passed away. He had been her muse and he was gone. What happened next is an inspiration to writers. She discovered it is possible to keep writing and even find joy in it. You need to read it in her words, though. Truly a message for the ages. As I mentioned previously, Louise Penny has almost an entire shelf in the mystery section at our local bookstore and her books are very popular. To say she is a successful writer is an understatement. Yet, like another mega-bestselling writer Robert Galbraith (J. K. Rowling), she completely ignores tight/limited third person point of view and blithely “head hops” from character to character, sometimes from paragraph to paragraph. From my understanding, the narrator doesn’t feel far enough away from the characters to be truly omniscient, either, so probably would be called third person multiple? In any case, it appears that third person limited POV is good for beginning writers who have trouble moving from character to character without confusing readers, but masterful writers can loosen up third person point of view successfully and readers seem to prefer it. Another reason it is apparent she is a masterful author is that Louise Penny has a wonderful knack with setting (especially her descriptions of snow), is fantastic at developing realistic characters who drive the story, and she knows how to build a complex and believable plot. Many authors can are good at one or two of those. Kudos to Penny for being able to conquer all three. Having a concrete setting in your novel helps orient the reader and can be used to establish the tone, but how do you go about writing realistic settings if your main character travels the world — while you stay at home — or lives in a place far from where you reside? The answer is research. I’ve made a list of 7 internet tools that can be used to build accurate, realistic settings for novels. 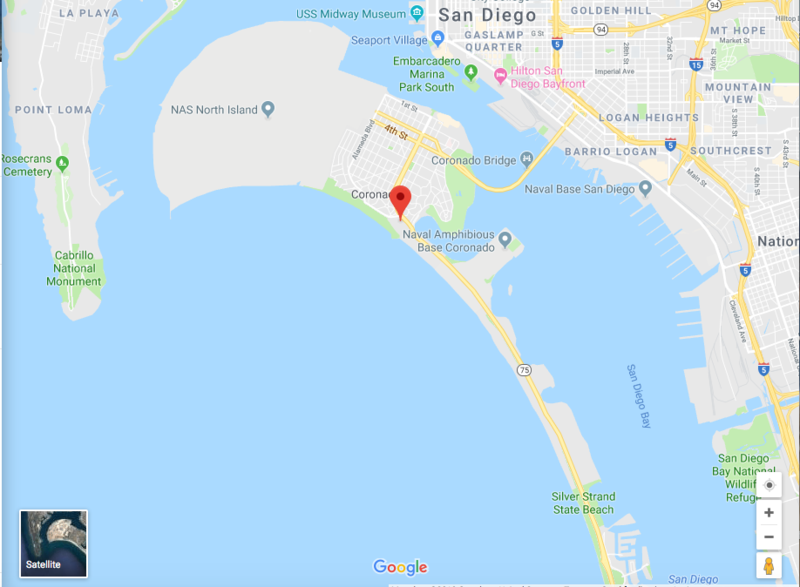 To help explore the potential of each tool, let’s run through an example of a novel set on Coronado Island, California, USA. Google Earth has different versions. You can download a version onto your desktop computer, an app to your Android device, or use it on the web via Google’s Chrome browser (the web-based version doesn’t currently work in other browsers). Google Earth gives you three dimensional maps that can be an airplane view or a bird’s eye view of a particular location. Many maps are supplemented with videos, guided tours, etc. Google Earth is particularly helpful for giving you the overall lay of the land, so you know where to stage a romantic picnic for your characters. Or hide a body, if it is a mystery novel. Chances are you’ve used Google Maps to find directions to a restaurant or shoe store or your friend’s house. But have you used all its features for writing realistic settings? (Screenshot used for educational/discussion purposes). When you first type in a name or address, you will get this map view. See the satellite view in the lower left corner? Click on that for an overall view. Also, see the little yellow guy on the bottom right corner? You can use your mouse to drag him into the map for a street view of a particular location. I plopped him right on the beach, as you can see in the window on the bottom left hand corner. You can move around at street level and see detailed landmarks. 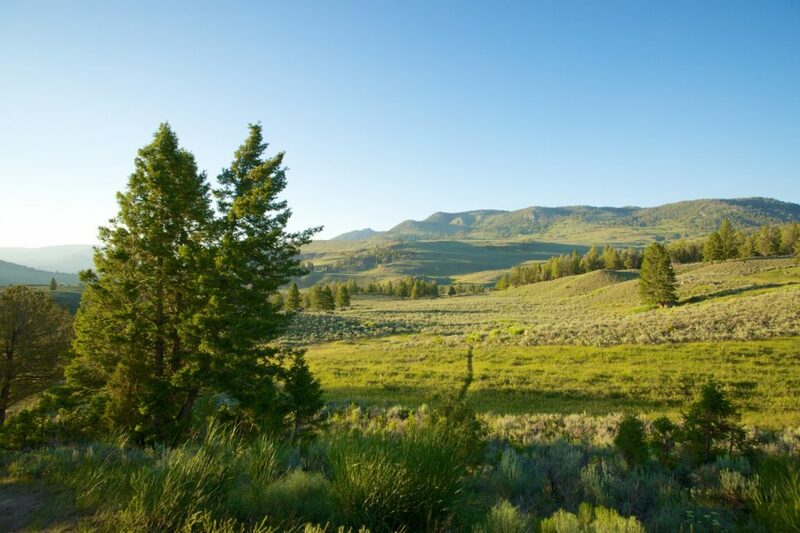 Get an accurate idea of vegetation, architecture, and more. It’s a blast! Once you have the general details, you may want to return to the map for specific scenes. You can even calculate how long it would take your character to drive from place to place. According to Google Maps, that above image was taken in July, 2016. What if you want to set your story in January 1968? What weather would your characters experience? Luckily, you can look up historical and current weather information for a given location at Wolfram Alpha. According to my search, it was clear and sunny like this 30% of the time in January in 1968 and the average high was 68° F. It also reveals which days were cloudy, which were foggy, and what the percentages were. Want to send your characters out to have a picnic at sunrise? You can find out what time that would be on a given day and place, where the sun would be in the sky, etc. As a writer, you know to add sensory information to make a place more vivid. YouTube videos can help you add both images and sounds to your descriptions. Although I found videos from Coronado with traffic noise and dogs panting, this would be good for a sunrise at the beach scene. Don’t forget to include the cultural setting as well as the physical one. Do the locals have an dialect or accent? Do they celebrate certain holidays? YouTube can help with those, too. 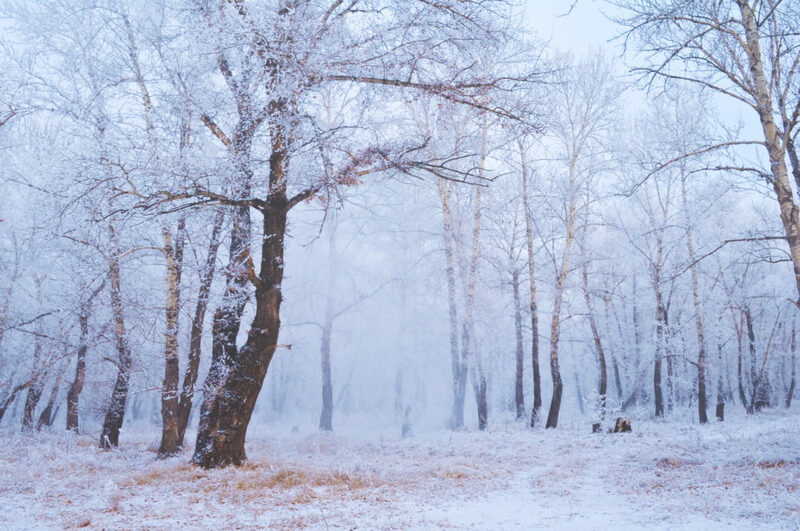 In My Defens has compiled a wonderful list of videos that feature ambient sounds from different settings that are perfect to listen to while writing. I often use them to drown out background noise. This is a pretty new app that allows you to see brief Snapchat videos that anonymous users have posted at a given location. It is oddly addicting and also an fantastic source of ideas and inspiration. Add a location to the search box. Once the map comes up, click on the colored areas that indicate hot spots. Even if there aren’t any, sometimes clicking on a location of interest will yield a video or two. 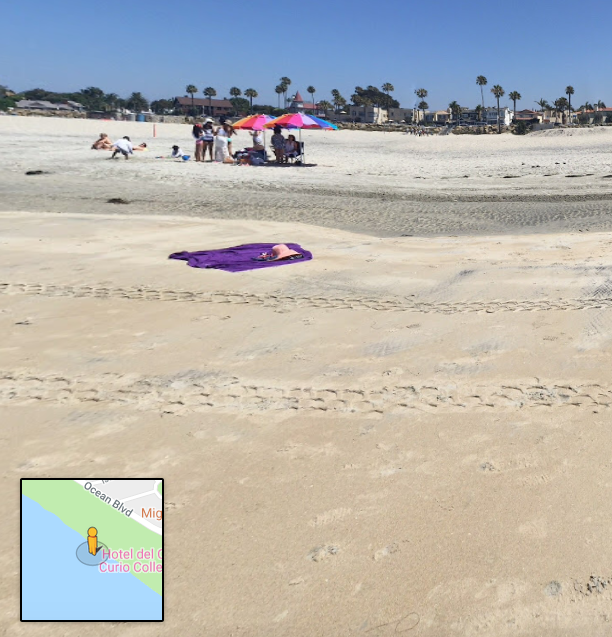 When I checked Coronado Island, I found a young woman’s selfie video taken at the beach hours before. You could hear the waves and wind. Her looks, clothing, and what she said were great clues to cultural setting. Try a few locations and times to get a good idea of Snap Map’s full potential. Be sure to utilize the awesome power of Wikipedia, especially since articles are often edited by people with ties to a given location. 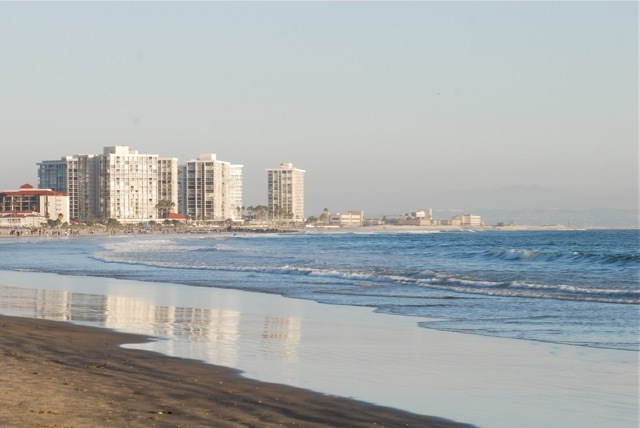 In addition to information about geography and history of a given place (for example, Coronado), it also offers lists like regional cuisine in the US, regional dialects (check different languages), etc. The links to references can be invaluable, too. Of course, travel blogs and social media can also help fill in details of a particular setting. Just keep in mind travel blogs which used to be someone’s clunky personal diary of a trip, now may be highly-curated articles and images sponsored by (paid for by) local tourist attractions. If you do manage to find an authentic one, don’t be afraid to ask the blogger or poster questions about local flavor. With a good sense of place in your mind through careful research, you can cherry-pick specific experiences and details to create a concrete, powerful setting unique to your novel. What tools did you try? Do you use any others? We’d love to hear about them. Today I’m reading Kingdom of the Blind by Louise Penny for Book Beginnings on Fridays. Book Beginnings is a fun meme hosted by Rose City Reader blog. To participate, share the first sentence or so of a novel you are reading and your thoughts about it. When you are finished, add your URL to the Book Beginnings page linked above. Hope to see you there! A stranger has named Chief Inspector Armand Gamache to be one of the executors of her will, along with a bookseller named Myrna Landers and a young builder. Still suspended because of an investigation in a case that went wrong months before, Gamache agrees to accept the task as a way to keep occupied. What would seem to be a straightforward duty becomes troublesome, however, when they read the bizarre terms of the will, which before long leads to murder. As if that weren’t enough, the case that got him suspended rears its ugly head again and he must track down missing drugs and work to clear his name. Armand Gamache slowed his car to a crawl, then stopped on the snow-covered secondary road. This was it, he supposed. Pulling in, he drove between the tall pine trees until he reached the clearing. There he parked the car and sat in the warm vehicle looking out at the cold day. Snow flurries were hitting the windshield and dissolving. The Chief Inspector Gamache series are set in Canada, around Québec and Montreal. I love the way she describes the snow and the cold. Although this copy is from the library, I noticed that Louise Penny has almost an entire shelf to herself at our local bookstore. Her books are very popular. Do you think it is surprising that the title is Kingdom of the Blind rather that The Kingdom of the Blind? Have you read any of this series? What do you think? Time to jot down a few notes after reading Celine* by Peter Heller. Private investigator Celine is renowned for her ability to track down missing persons. When a young woman’s father goes missing in Yellowstone Park, Celine leaves the comfort of her apartment in New York City to track him down. Although Celine is older (late 60s) and has emphysema, she still can shoot, drive, and attach tracking devices to suspect’s vehicles with the best of them. Some reviewers say his main character is unrealistic. According to the blurb at Amazon, however, Heller based the main character on his mother, who was actually a private investigator. How Heller handles the opening set up for the novel is unusual. He reveals the details of the client’s missing father in chapters two through four as a series of conversations between the woman and Celine. Sometimes the dialogue goes back and forth in big blocks of text with a bare minimum of tags. To break things up, he has the young woman leave and send Celine a letter containing some of the facts before they talk again. Even though these chapters are essentially an information dump, the author withholds at times and reveals bits of backstory of characters at times, and thus keeps the reader interested enough to continue reading. I’m not sure the extended conversation without much action would have been my first choice with a mystery, especially since it duplicates some of the prologue, but overall it worked. The author’s word selection and descriptions are lovely and you can tell he has an MFA. At times the novel seems to wander into the literary rather than mystery and there is a bit of road trip trope thrown in as well. In fact, the plot/tone feels like a car trip along a long, flat stretch of road with a few stops at cafes or roadside attractions to add surprises along the way. The fact the traumas occurred in a past (distance), the lack of realistic conflict (Celine confronts some bikers in a bar in a scene that went beyond contrived), and the main characters who rarely make mistakes, it all adds up to make the plot seem flatter than it should have been. A disappointment, given the premise. Let’s take a look at Celine by Peter Heller for Book Beginnings on Fridays. Summary: Private investigator Celine is renowned for her ability to track down missing persons. When a young woman’s father goes missing in Yellowstone Park, Celine leaves the comfort of her apartment in New York City to track him down. It was bright and windy, with the poppies flushing orange down the slopes of the bluffs, all mixed with swaths of blue lupine. The Pacific was almost black and it creamed against the base of the cliffs all along Big Sur. He loved this. The call had come while she was at her workbench wiring the naked taxidermic form of an ermine onto a rock, beside the skull of a crow. The novel follows a common mystery format by introducing the victim in the prologue and the investigator in chapter one. I’m really looking forward to reading this novel for a few different reasons. First of all, the protagonist is a 68-year-old woman who is also a private investigator. Also, the author’s own mother, who was also a private investigator, inspired the story. Finally, a friend recommended it for its lush descriptions of the setting. I can’t wait to delve into it. What do you think? Have you read anything by Peter Heller? Do you think you’d like to read Celine? Today I’m starting a book set in Detroit, Michigan: Lives Laid Away by Stephen Mack Jones for Book Beginnings on Fridays. Summary: Detroit ex-cop August Snow spends his time renovating houses in a neighborhood called Mexicantown. After a young girl from the community is found dead, Snow discovers she was last seen alive during an ICE raid. Soon he is embroiled in a violent campaign to prevent the perpetrators from acting again. Her secret ingredient was nutmeg. Not a lot — maybe half teaspoon or less — but she got the same complex undercurrent effect that she would have with smoked East Indian paprika or authentic Mexican chili powder. I read some reviews of this novel that suggested it has a lot of violence, but that doesn’t seem to be the case with the beginning. In fact, I really like the description. I want to know who “she” is and also what exactly the narrator is making. What do you think? Have you read a book by Stephen Mack Jones? Would you read this one? Aside: I have website that lists children’s books set in 50 different states, and thought it might be fun to try the same thing with mysteries. I already have three mystery series set in Arizona. Do you have any suggestions for others? 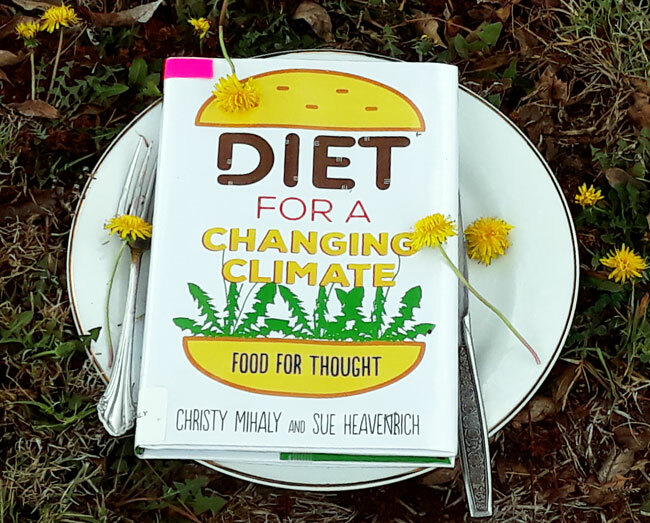 For our first ever Books In Their Appropriate Settings (Bookitas) post, we have Diet for a Changing Climate: Food for Thought by Christy Mihaly and Sue Heavenrich. Today I have the most recent in the No. 1 Ladies’ Detective Agency series, The Colors of All the Cattle by Alexander McCall Smith, for Book Beginnings on Fridays. Summary: Precious Ramotswe, owner and chief detective of the No. 1 Ladies’ Detective Agency, allows herself to be pulled into running for a seat in a local Botswana election. To help her stay on top of everything, her apprentice Charlie takes over the case of a hit-and-run victim, perhaps before he is ready. Mr. J.L.B. Matekoni, owner of Tlokweng Road Speedy Motors, and one of the finest mechanics in Botswana, if not the finest, was proud of his wife, Precious Ramotswe, progenitor and owner of the No. 1 Ladies’ Detective Agency. Isn’t it clever how Alexander McCall Smith introduces two main characters and the setting in the first sentence? I immediately wonder why Mr. Matekoni is proud of his wife. One of the things that has made these novels so popular is the Botswana setting. For instance, I always find the names of the businesses to be so memorable. These are not high tension mysteries, but instead more of a stroll. What do you think? Have you read any of the No. 1 Ladies’ Detective Agency series novels? Today we’re getting ready to start the next novel in The Bestseller Code Challenge List, Maine by J. Courtney Sullivan, for Book Beginnings on Fridays. Summary: Four Kelleher women gather their families at their summer beach house in Maine, each bringing their own secrets and issues. Alice decided to take a break from packing. She lit a cigarette, leaning back in one of the wicker chairs that were always slightly damp from the sea breeze. Already I wonder why she’s packing up the summer home before anyone else arrives. Although this looks like a summertime beach read, it also might be a great way to escape from the February blah weather. What do you think? Have you read Maine by J. Courtney Sullivan? Would you like to read it?